"I pledge my everlasting affection and devotion to this roasted pepper soup." These are the words that caught my eye when I was making my daily stop by Prudence Pennywise, sometime last week. In that moment, I knew that I was destined to make this soup and I did. I second Prudy's above statement and add "I will never make another recipe for Roasted Red Pepper Soup other than Prudy's". Maybe you don't have a love affair with this soup like I do. I have tried it a million times at a million places (even last friday), the best I have tried so far, is from Big City Bread Cafe, the most original, quirky place I have ever frequented. It was delicious there, with a fresh piece of mozzarella drop in, which melted ever so slowly. Oh, Athens, how I miss you! Anyway, back to the soup. I have tried making it at home and Prudy's topped all the recipes I have tried. It was perfect! I used 2 red and 1 yellow pepper, left the skins on after roasting them and just pureed it all. I omitted the butter at the beginning and used 4 cups of chicken stock. I stirred in a little whole milk at the end instead of cream and even dropped a tiny ball of fresh mozzarella in mine, which was adorned with fresh basil leaves. (How I love growing fresh herbs!) I could go on all day about this soup. Really, it is that good. Try it! A word about the awesome sandwich we had on the side and even dipped in the soup. It was wonderfully delicious. We absolutely love edamame at our house and this sandwich was great. I used a monterey jack/ colby combo for the cheese and grilled them in the George Foreman grill. This was a perfect fall dinner! Preheat oven to 425 degrees F. Slice off top 1/2 inch of garlic bulb. Leaving bulb whole, remove loose, outer layers. Place bulb, cut side up, in custard cup. Drizzle with oil. Cover with foil; roast 15 minutes, until soft. Cool. Meanwhile, cook edamame, according to pkg directions. Drain and rinse with cold water. Squeeze 3 garlic cloves from bulb into food processor. Wrap and refrigerate remaining garlic for other use. Add cooked edamame, lemon juice, 1/4 cup water, 1/2 tsp salt, and cumin to garlic in food processor. Cover and process until smooth. Transfer to a bowl. Stir in parsley. 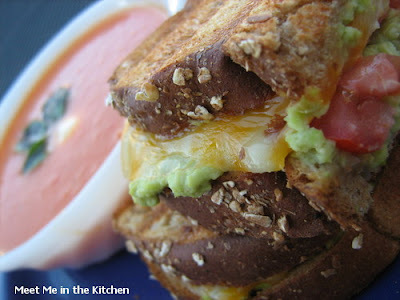 For each sandwich spread 2 Tbls edamame mixture on two slices whole grain bread. Top one bread slice with 1 oz thinly sliced cheese and tomato slices. Add second bread slice. On nonstick griddle or nonstick skillet toast over medium-high heat, turning once. I like how you lightened the soup. 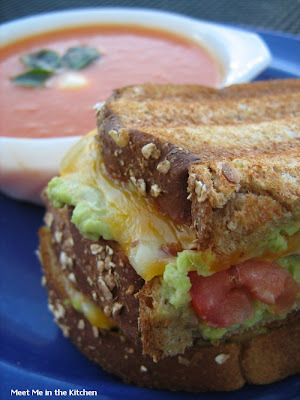 I will have to try edame in a grilled cheese sandwich. Wow, that soup looks amazing as do the sandwiches- great job! 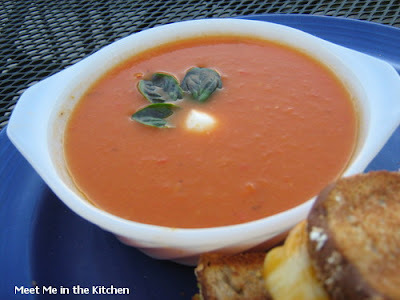 That soups looks delicious and your sandwiches - wow! I love edamame and would never have thought to put it in a sandwich like that, looks fantastic! That looks so good. I'll have to join the party and make some of my own! I am hungry now! 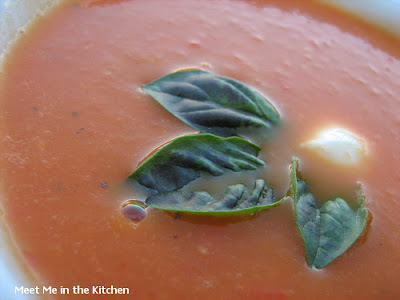 We actually just made that soup too, it will be on our blog soon! It was so good! Thanks to Prudy!! I love the edamame on the sandwich. Genius Idea!! I will pair that with the soup next time! 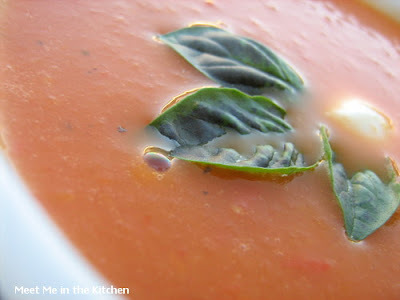 Your roasted red pepper soup looks and sounds delicious! I've only ever made soup once, but this looks like something I could try if I'm ever in a soup making and eating mood. Doesn't Erin always have the best recipes!! Those sandwiches look really really really good!! I might even try it without the cheese.. I guess it wouldn't be considered a grilled cheese sandwich anymore. I saw when Prudy made this and also wanted to make it quickly! Yeah, that sandwich you paired with it looks truly heavenly too. I just ate dinner and feel myself getting hungry again...need to make this! Those look so good. I really must make Erin's soup. I fell in love with it when I saw it on her page and you have made me fall in love with it again. I Love the idea of a edamame sandwich! It looks fabulous! Oh man, why didn't we have a potluck so I could have one of your sandwiches? Nothing beats soup and grilled cheese in my book, nothing at all. Thanks so much for your kind words about this soup. Whenever I think about it, I want it for dinner. I love your light changes too. And last but not least, we are making your peach ice cream this weekend. Can't wait. Thanks again.